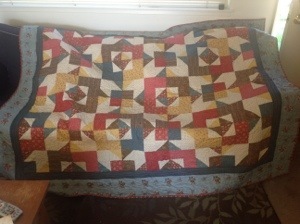 I finished a quilt last month. Amazing when you think about how busy I’ve been with birthday, ALA in Chicago, trip to Vegas and adding in an exercise regime. In the past I’ve gone to The Granary in Sunnyvale for their monthly Happy Hour. Relax, it’s not a bar. It’s a quilt shop. 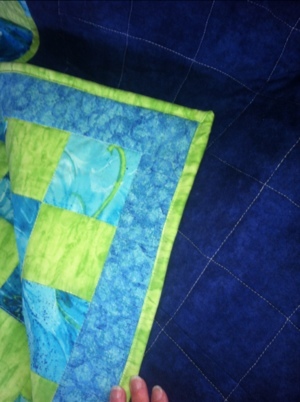 I started going to force myself to expand my quilting horizons… And that it has. 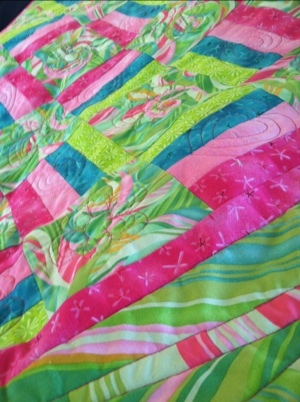 Happy Hour gives you a pattern and most of the fabric for a quilt. 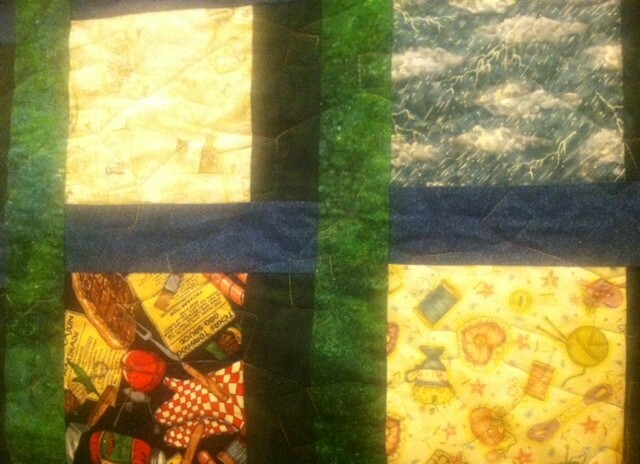 Everyone gets the same fabric, but you make it your own with the addition of a background, borders and binding. 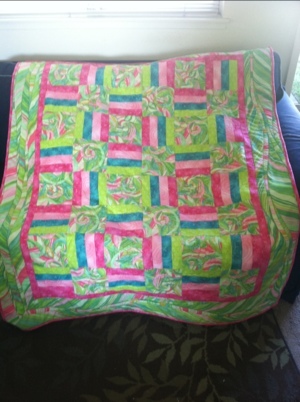 I’ve made quilts in patterns and colors that I wouldn’t typically try, like Day Dreaming by Cozy Quilt. 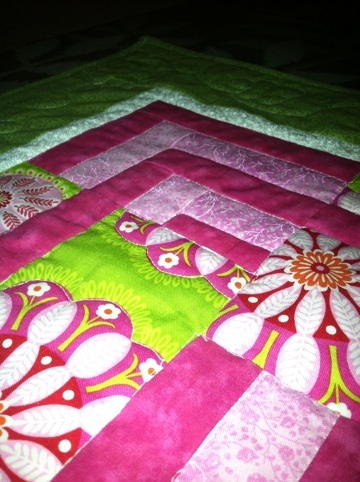 The colors in the quilt are definitely not my style, but that’s the point, right? Unfortunately they look washed out in all the photos I’ve taken, but they’re not. They’re really much richer than they appear. 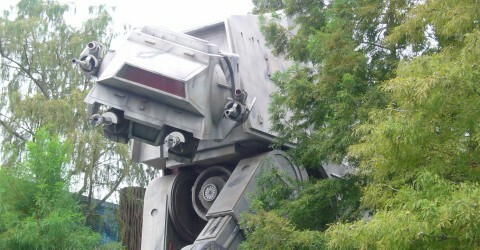 Here’s a close up so you can see what I mean. 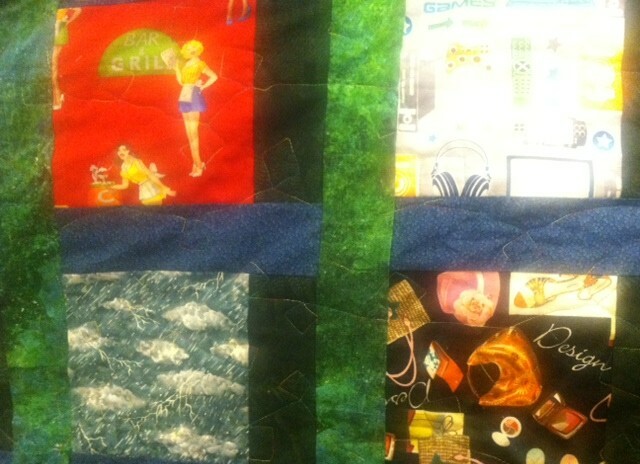 Also, you can see my quilting. 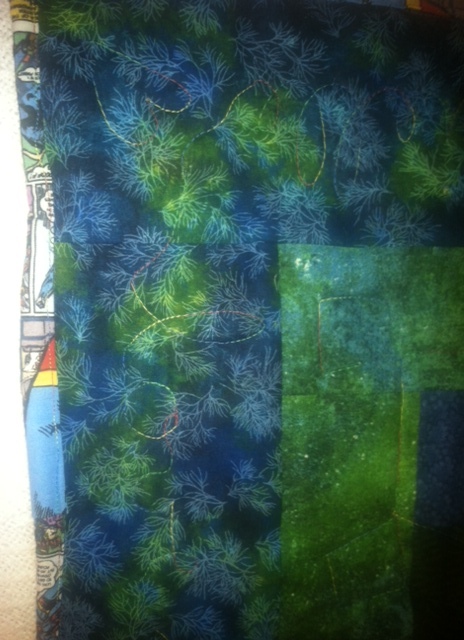 And here’s the borders and binding. 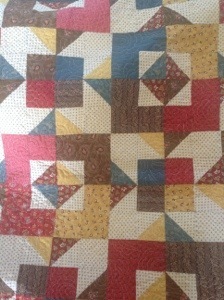 The backing is a buttery yellow flannel so it’s nice and soft. 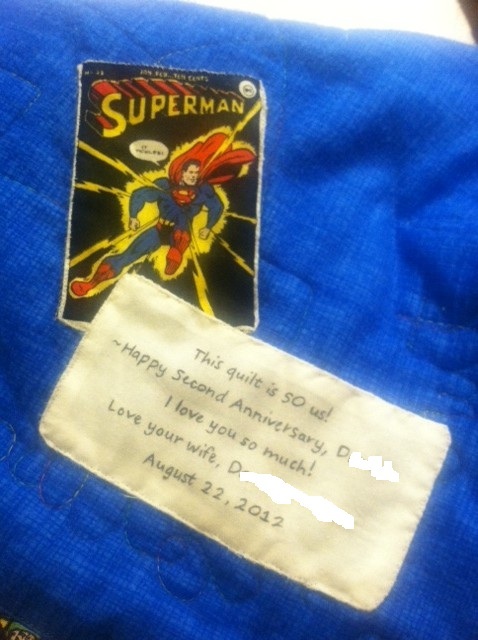 I officially finished the second project for July 2012 tonight when I buried the last thread and attached a label. This project has been sitting in my queue for quite awhile. 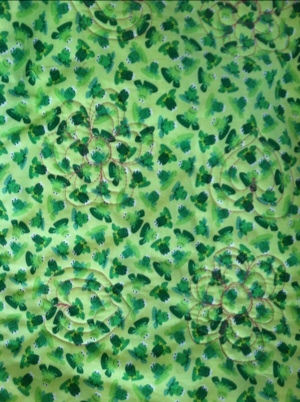 I won the fabric for the top and the pattern during a shop hop a few years ago. I guess I never really had a reason to sew it together until now. 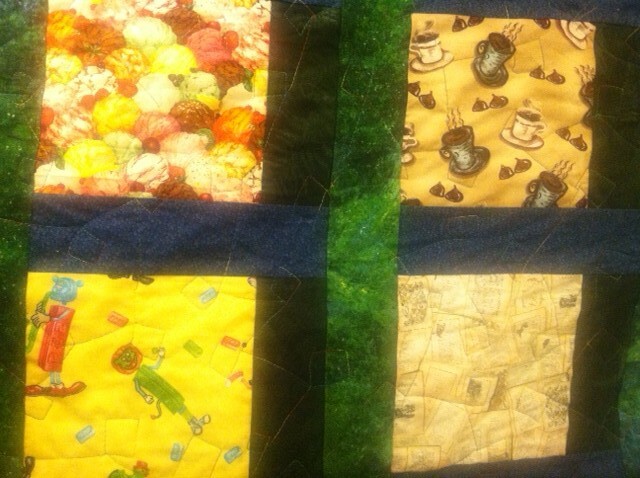 This baby quilt was made for a coworker (and I say friend after all of the help/concern he displayed today) of DH’s. The friend, K, and his wife M are expecting their first baby at the end of August. They’ll be having a little girl. I found a tutorial online for making these cute flowers. And I decided to alternate with hearts. I didn’t know what to do with the border, so I stitched along the wavy pattern to create a little interest. I chose a cute little frog print for the back so K and M could have a break from all the pink they’re sure to receive at tomorrow’s baby shower. So, here’s to your new baby, guys! I hope she’s beautiful and healthy and that she brings you both all the joy in the world! This project has been mostly finished for about a week. 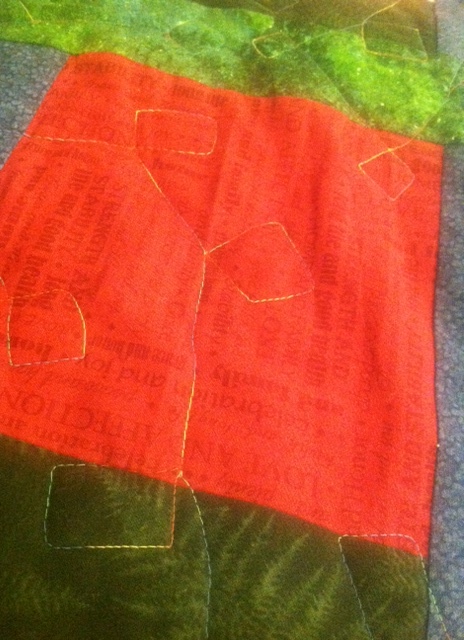 Today I buried the threads and sewed on a quilt label. So, this is project number 2 for June! I knew I wanted to make the dinos the focus of the quilt, and I knew I needed to have them be in 6″ squares to have all the dinos fit. 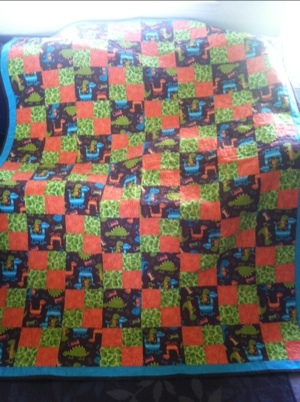 Luckily enough I found the coordinating green, orange and blue fabric nearby! The four patch was born. I was also lucky enough to find the backing at the same store. 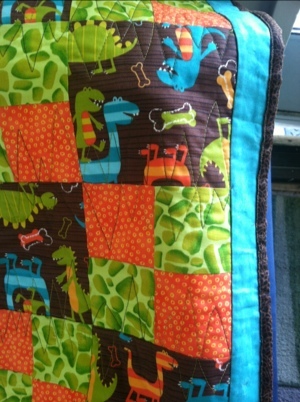 I knew I wanted the quilting to go along with the dinosaur theme. I couldn’t figure out how to make dino footprints so I settled on dino teeth. ROAR! 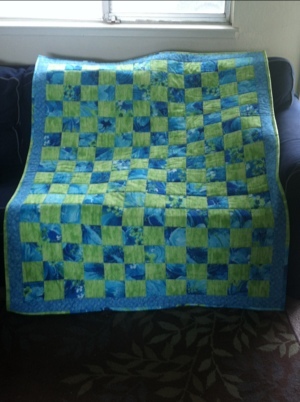 I used variegated green thread. I hope my little cousin K loves his roaring dinosaur four patch. I actually finished the quilt top last month. Then I stalled out on my sewing. I’m so used to sewing at the dining room table that when I moved my stuff upstairs it felt a bit foreign. One thing’s for sure though – when we buy a house, I’m getting a better table. The one upstairs is a folding plastic table from Costco. It vibrates way too much to work on consistently. Plus it’s at a weird height. Oh well. Enough about that. You’re here to see a quilt! 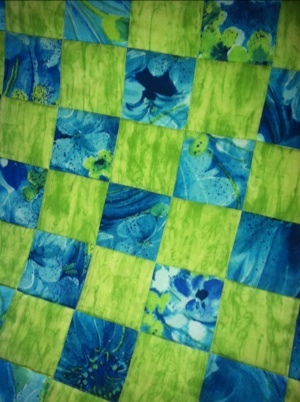 I bought the fabric for the squares from a store that went out of business a couple months ago. 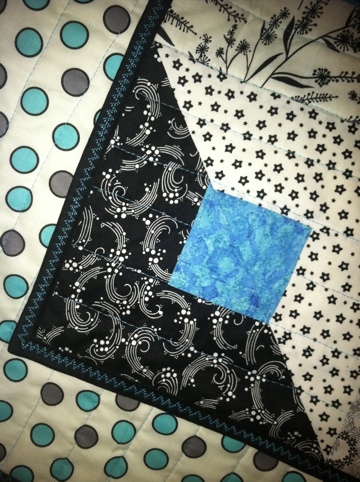 The border was leftover fabric from the black/white/blue quilt I made for my friend B. This picture doesn’t do the colors justice. The green is a yellowy green but it’s definitely not dark. Again with the bad lighting – I apologize. I followed the same pattern as last month for the quilt I made for my boss’ new grandson but I used different fabrics this time. It ended up the same size too so I’ll keep it in my stash for the next person who has a new baby boy. 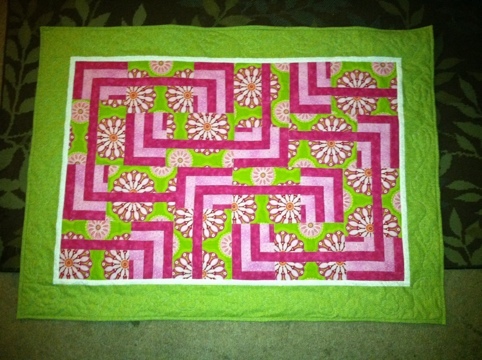 And because I made it with babies in mind, the backing is flannel. There! This is much closer to the actual colors! I did try fusible batting this time around. I don’t think I’ll use it again. 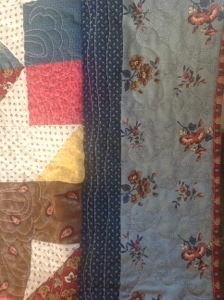 It took twice as long to “baste” the quilt together as compared to my normal pin basting method. 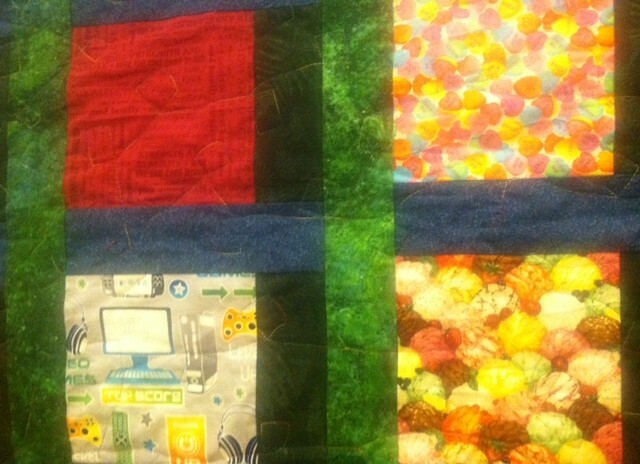 It also resulted in a very stiff quilt, which was challenging to quilt. Let’s hope the fusible stuff washes out all the way! Either way, I’m pleased with the way this turned out. 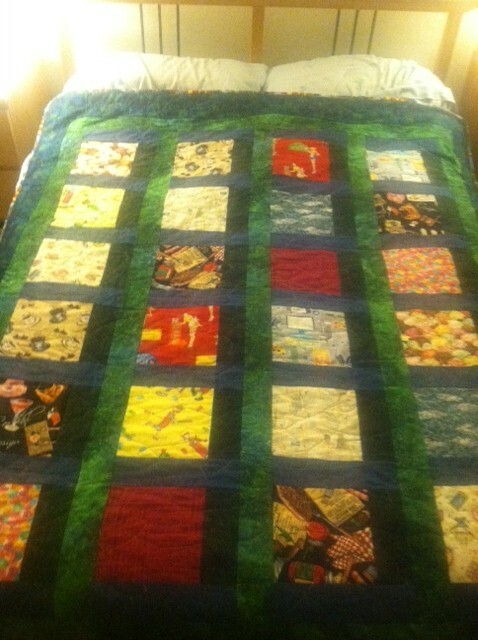 Here is the project I completed for March 2012. My friend B’s birthday is at the end of the month so this will be his present. I hope he likes it! I did something different with the binding this time. I used a decorative stitch from my machine to add interest. 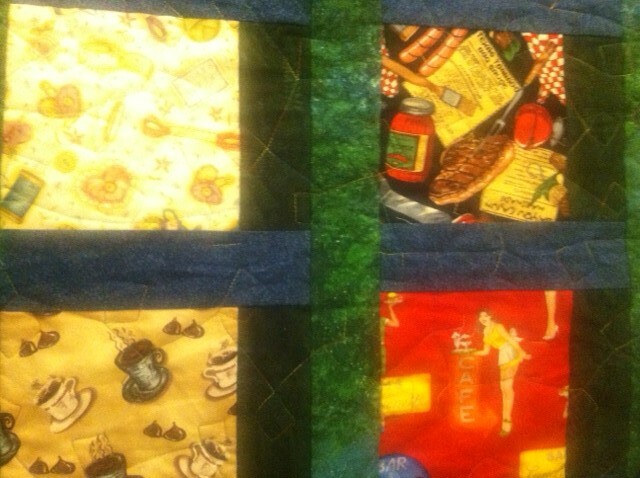 The quilting is all done with straight lines freehand. 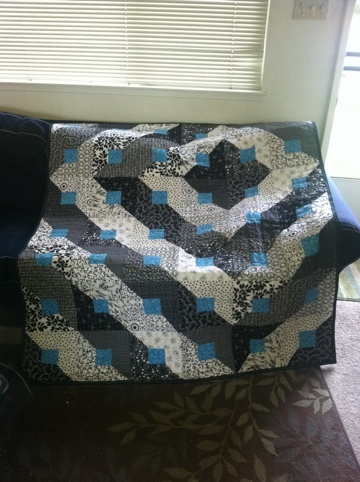 The lines aren’t perfect by any means, but I like that they make the quilt look a little less geometric. 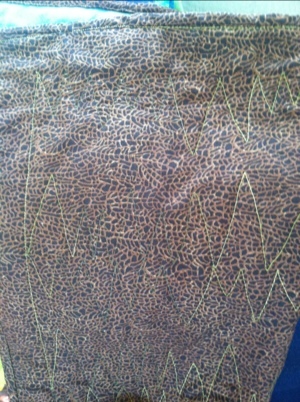 Here’s a closeup of the binding. I found some really cute polka dot fabric for the back. And because I brought in my finished top when I picked out the backing, I got it for 20% off! Score! I actually pieced this one in November (I think). 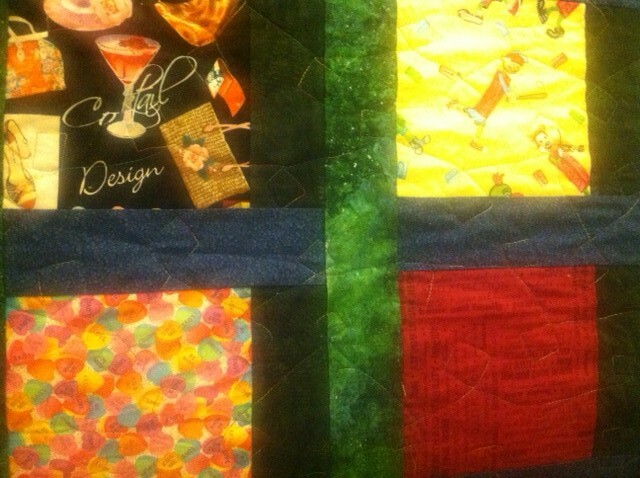 I remembered last week that I had the stuff I needed to quilt it up! So, here’s my February quilt.